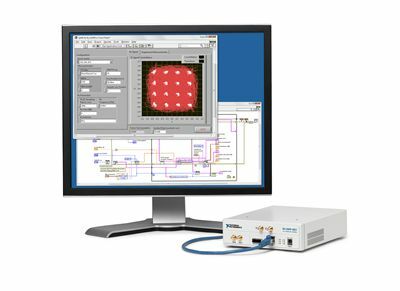 National Instruments has announced the NI USRP-2920 and NI USRP-2921 universal software radio peripheral (USRP™) instruments, offering a new educational platform that delivers hands-on learning with real-world signals to RF and communications university labs, which previously relied on computer-based simulation to augment theory. The new platform, consisting of NI USRP hardware, NI LabVIEW software and lab-ready course material, provides educators with an affordable, off-the-shelf solution that exposes students to practical application of abstract mathematical theories learned in traditional lecture. With this platform, students can now explore the link between abstract mathematical theory and practical implementation through hands-on experimentation with a working communications system. The NI USRP devices feature a software-tunable front end ranging from 50 MHz to 2.2 GHz or the 2.4 GHz and 5 GHz ISM bands. The hardware also integrates a software reconfigurable RF transceiver with high-speed A/D and D/A converters, which makes it possible to stream baseband I and Q signals to a host PC over Gigibit Ethernet at up to 20 MS/s for real-time access to the spectrum. Undergraduates have already proven NI USRP technology as ideal for use in the lab as part of a pilot electrical engineering course at Stanford University. The spring 2011 class gained a deeper understanding of engineering concepts through hands-on projects in which they designed a complete communications system. Educators can use the NI USRP platform to teach courses and topics such as digital communications, communication system design, antenna theory, digital modulation, wireless communication, software-defined radio, digital signal processing and information theory. Additionally, the new USRP educational platform functions as a scalable solution for communications experimentation, research, and rapid prototyping. Readers can learn more about the NI USRP platform by visiting www.ni.com/usrp. National Instruments (www.ni.com) transforms the way engineers and scientists design, prototype and deploy systems for measurement, automation and embedded applications. NI empowers customers with off-the-shelf software, such as NI LabVIEW, and modular cost-effective hardware that integrates to form unique engineering solutions. NI sells to a broad base of more than 30,000 companies worldwide, with its largest customer representing approximately 4 percent of revenue in 2010 and no one industry representing more than 15 percent of revenue. Headquartered in Austin, Texas, NI has approximately 6,100 employees and direct operations in more than 40 countries. For the past 12 years, FORTUNE magazine has named NI one of the 100 best companies to work for in America.